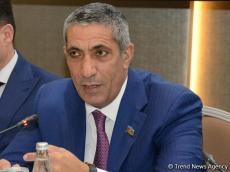 Azerbaijan’s national leader Heydar Aliyev put the country’s interests above everything, deputy executive secretary of the New Azerbaijan Party, MP Siyavush Novruzov said. Novruzov made the remarks in Baku May 10 at the special meeting of the Azerbaijani parliament dedicated to the 95th birth anniversary of national leader Heydar Aliyev. "National leader Heydar Aliyev fought against injustice, he was a fighter,” he said. “Betrayal of some people was the most painful issue for the great leader." “Heydar Aliyev was a person who worried about the problems of all mankind, he worked for all mankind,” Novruzov added. "The national leader did not want to create a party,” he said. “But then the New Azerbaijan Party was created to change the status of the population. Presently, the New Azerbaijan Party is carrying out comprehensive work to continue the policy, the foundations of which were laid by the great leader because this is the policy of Heydar Aliyev. Our duty is to work for the preservation of the eternal independence of Azerbaijan."